When complete, 2 and U will have 38 floors, 660,000 square feet of office space, 18,000 square feet of retail space, and 24,000 square feet of covered outdoor open space. Portland Bolt was selected to provide the anchor bolts for the 2 and U project, and these were not your run-of-the-mill anchor bolts. Over 40,000 pounds of F1554 Grade 105 anchor bolts, ranging in diameter from 1-3/4” to 2-1/4” were produced by Portland Bolt. Not only were the anchor bolts exceptionally long, with lengths as long as 288”, they also had very long thread lengths, with some of the bolts having threads over 5 feet long. Portland Bolt’s 94,000 square foot manufacturing facility is designed to be able to efficiently manufacture large, long anchor bolts such as those required for this project. 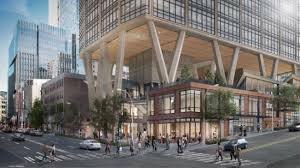 Packaging and shipping arrangements were also critical for this project, as you can imagine the difficulties of delivering anchor bolts of this size to a jobsite in bustling downtown Seattle. Contact our sales department at Portland Bolt next time your project requires large anchor bolts. We’re ready to tackle the toughest challenges no matter where we’re shipping!